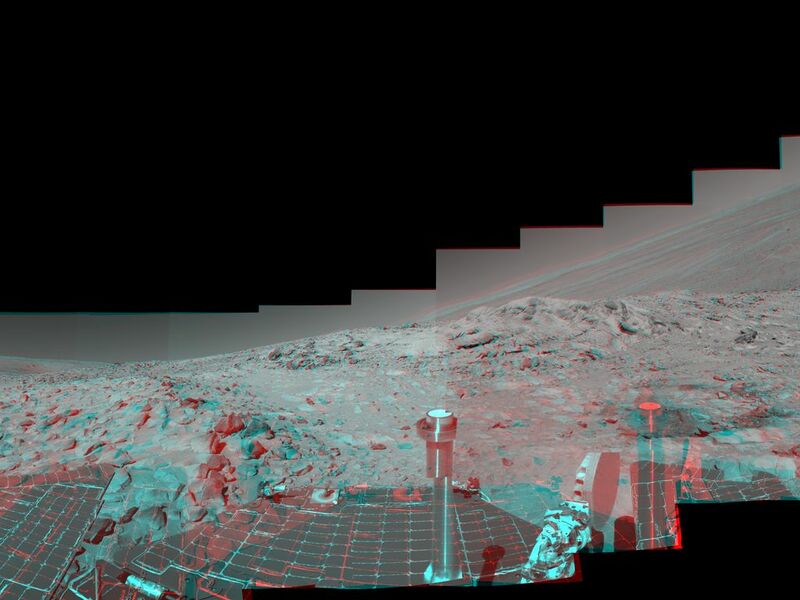 This mosaic of images from NASA's Mars Exploration Rover Spirit shows a panorama of the "Columbia Hills" without any adjustment for rover tilt. When viewed through 3-D glasses, depth is much more dramatic and easier to see, compared with a tilt-adjusted version. This is because stereo views are created by producing two images, one corresponding to the view from the panoramic camera's left-eye camera, the other corresponding to the view from the panoramic camera's right-eye camera. The brain processes the visual input more accurately when the two images do not have any vertical offset. In this view, the vertical alignment is nearly perfect, but the horizon appears to curve because of the rover's tilt (because the rover was parked on a steep slope, it was tilted approximately 22 degrees to the west-northwest). Spirit took the images for this 360-degree panorama while en route to higher ground in the "Columbia Hills." The highest point visible in the hills is "Husband Hill," named for space shuttle Columbia Commander Rick Husband. To the right are the rover's tracks through the soil, where it stopped to perform maintenance on its right front wheel in July. In the distance, below the hills, is the floor of Gusev Crater, where Spirit landed Jan. 3, 2004, before traveling more than 3 kilometers (1.8 miles) to reach this point. 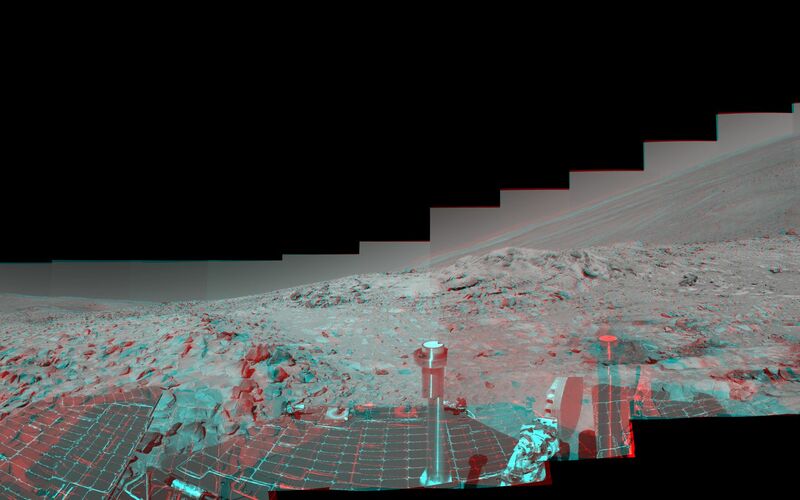 This vista comprises 188 images taken by Spirit's panoramic camera from its 213th day, or sol, on Mars to its 223rd sol (Aug. 9 to 19, 2004). Team members at NASA's Jet Propulsion Laboratory and Cornell University spent several weeks processing images and producing geometric maps to stitch all the images together in this mosaic. The 360-degree view is presented in a cylindrical-perspective map projection with geometric seam correction.